An interview with Sepp Blatter, or perhaps with a Nigerian 419 scammer posing as Sepp Blatter. The former FIFA president—or, perhaps, a West African email con artist—on World Cup scandals, the candidates to replace him, and Donald Trump. The real Sepp Blatter last year in Zurich. On this week’s edition of Slate’s sports podcast Hang Up and Listen, Josh Levin discussed his email conversation with a scammer posing as Sepp Blatter. You can listen to that discussion by clicking on the player below. I know that you will be very surprise reading this message because you will hardly understand the true meaning of this communication until you respond for details, looking at my status as the former FIFA President, i believe you will be wondering what we have to discus maybe you are not a player but a football fan. Our discussion is personal which is very far from football and i humbly employ you to keep my message privately to yourself alone. I look forward towards receiving your reply urgently to my personal email. The message was signed Joseph “Sepp” Blatter, 8th President of FIFA. This email couldn’t have come at a better time. Later this week, soccer’s governing body will convene in Zurich to vote on Blatter’s replacement, deciding which fantastically named man—the candidates are Sheikh Salman bin Ibrahim al-Khalifa, Gianni Infantino, Prince Ali bin al-Hussein, Jerome Champagne, and Tokyo Sexwale—will become the next FIFA president. Other than Tokyo Sexwale, there’s no one who I’d rather hear from at this vital moment than a probably-Nigerian spammer posing as Sepp Blatter. A couple of days before Sepp dropped me a line, his email address was flagged by the websites Scam Warners and Fraud FYI. The site 419scam.org—a 419 scam, in the simplest possible terms, is when someone convinces you (typically via typo-laden email) to send them a bunch of money—noted that the same email address had been used by someone posing as former German president Horst Köhler. Given these circumstances, it seemed like fair play to create a new identity for myself. That way, Sepp/Horst and I could be on equal footing. On Friday morning, I sent the former FIFA president a note from my new email address, clintdempsey8@gmx.com. I was surprised to hear from you given that you are the former FIFA President. What have you been doing lately? Has the international investigation of FIFA been a difficult ordeal for you? Please let me know what sort of personal discussion you would like to have that is very far from football. Though I think we both know that discussions that are far from football are never really far from football, if you know what I mean. Thank you so much for your wonderful impressive reply. I don’t know how often you read sports news because i faced challenges from competitors that wanted to replace me as FIFA President. I did everything possible to ensure that illegality is not discovered in my carer and was totally free from all accusation. Hence, i need you to clear a fixed deposit which i made in the name of a deceased footballer. I will present you as a relative to the deceased footballer so that you will receive the fund without hitches. The total amount involved is eighteen million five hundred thousand euro (€18.5 million) and you will have the privilege to own domiciliary account at the operative bank fixed management, also the fund maybe released to you through certified bank draft because payment can be conducted in several banking method. All I needed to do, he continued, was send along my direct phone number, surname, middle name, first name, address, country, and private email. “The above needful information will make this transaction a success immediately claim affidavit is issued to you from the ministry of justice,” he wrote. He replied with current photos of Sepp Blatter. Well played. Probably-Nigerian Sepp Blatter answered seven additional questions from “Clint Dempsey.” Those questions and answers follow. All typos are in the original emails. Fake Clint Dempsey: Do you have a recommendation for a hotel where I can stay in Zurich? I hear the Baur au Lac is very nice. Fake Clint Dempsey: Who do you support in the upcoming FIFA presidential election? Nigerian Sepp Blatter: The Football Association has agreed to support Gianni Infantino’s bid to replace me as Fifa president after reaching consensus at a board meeting on Wednesday, 3 days ago. I will always support ‘Gianni Infantino’ since the Football Association has agreed to support him. Fake Clint Dempsey: Who do you support in the U.S. presidential election? What do you make of this Trump guy? Nigerian Sepp Blatter: The Real estate developer Donald Trump’s speech announcing he is running for the Republican nomination for president contained a number of false and misleading statements. I think people should be considering other Republican presidential candidates like SenatorTed Cruz, Senator Marco Rubio. Fake Clint Dempsey: Who is a better player, Messi or Ronaldo? Nigerian Sepp Blatter: Messi is the world most outstanding player that this generation will hardly find someone to replace. Fake Clint Dempsey: Is Joe Flacco an elite quarterback? Nigerian Sepp Blatter: I think Joe Flacco is actually a very elite quarterback, He won a Super Bowl, he did it really to a certain extent. Fake Clint Dempsey: Did you accept any money in exchange for selecting the host country for the 2018 and 2022 World Cups? Fake Clint Dempsey: What happened to Brazil in that game against Germany? That was crazy. Nigerian Sepp Blatter: Oh yes it was crazy, and Brazil will continue to lose to Germany because their teamwork is currently 42% instead of their normal 85 - 89% teamwork. Impressed with Sepp’s answers but wanting to learn more, I asked to move the conversation to Skype. He did not like that suggestion. I don’t know if you like looking for excuses because anybody with such questionable attitude does not achieve meaningful success. We should be approaching final success of this deal if not for your questions and excuses which is honestly not relevant in a crucial business of this nature. I will add you on Skype hence provide your Skype, but you will hardly meet me on Skype because i am not always online and this conversation is confidential. Also, provide your details as i required earlier so that by Monday the backup document will be ready while you open communication with the fixed management bank for the release of the said amount. I replied: “Questionable attitude? That’s pretty rich coming from a guy who was banned from FIFA for eight years [since reduced to six], who’s currently under criminal investigation by Swiss authorities, who said that there’s no racism in football, and I could go on and on.” I also asked him who would win Sunday night’s game between the U.S. women’s national team and Canada. I am very sorry for some wrong statement made, I can understand that you know much about me and you also will understand that i have faced a lot at my old age. A man who wants to live long will always avoid problems because peaceful living is the root of long life. I plea you on my knee to assist me urgently in this issue because further delay might create vague of suspect since i have already informed the fixed management bank that deceased relative is interested in the fixed deposit. I need to procure the backup document in your name to municipally confirm a genuine relative of the deceased. Regarding the match between the US women’s national team and Canada, i believe that US will win because US Women team are more impressive than their men. Nigerian Sepp was indeed correct in predicting that the U.S. women would win. That prediction would’ve been more impressive if he’d made it before the game rather than several hours after it was over, though. At this point, I revealed to my pen pal that I was a journalist, and that I’d love to do a proper interview. I wanted to know why he’d chosen to impersonate Sepp Blatter, and whether he’d had any success with this approach. That was the last email that Sepp Blatter sent to Clint Dempsey. I don’t know much about Nigerian Sepp Blatter. I’m not sure who he is, or whether anyone has sent him 18.5 million euros to clear a fixed deposit in the name of a deceased footballer. 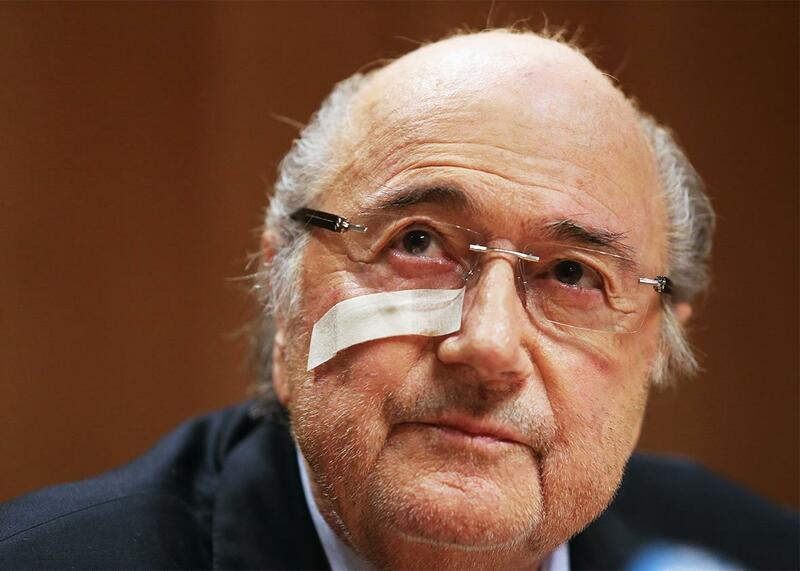 All I can say for sure is that he’s far more likable than the real Sepp Blatter.